I would buy this product again & again.! 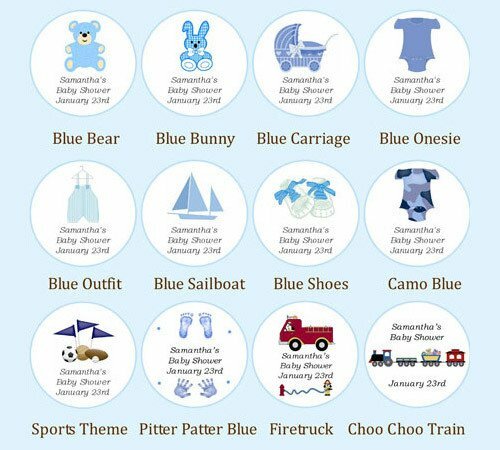 These look great as baby shower decor & gifts. Great product, better than it looked in the picture, nice smelling...everyone was very happy with their favours!! THIS ARE GREAT BABY SHOWER FAVORS. THEY ARE BIG ENOUGH AND GREAT TO USE AS "LABOUR BLESSING" I WILL TEXT PARTICIPANTS WHEN MOTHER IN LABOR TO LIGHT ALL THE CANDLES AND SEND A BLESSING. HIGH QUALITY!! Loved how they looked, the buttercream scent smelled really nice and finally a usable shower favor!! I plan to give as baby shower favors in a couple of weeks. I was very pleased with the serivce and how quickly they were sent and very pleased with the scent and a added bonus they come in garzana bags. Perfect!!! I ordered these for a baby shower that I was coordinating and the mother-to-be and all of her guests absolutely loved them! I like them so much that I am asking the hosts throwing my upcoming baby shower to order them for me! The candle was a big hit at my daughter's baby shower. Everybody liked it, I wish I had ordered more! 2nd time I've bought this product! I have used these candles for 2 different baby showers and they have been a big hit! I got the 3 oz size, which is plenty big and I love that they come individually wrapped in the organza bags...I didn't have to do anything extra to them. I made an errror on the date for personalization and discovered it the next day. They worked their magic and made the correction [...] and they were perfect. "Most Adorable Baby Shower Favor"
I used the little candle tin as a baby shower favor for my daughter's shower. I did the candle, bag and label in pink because we're having a girl and everyone loved them. The personalized label ( i did the carriage ) in pink and the baby powder scent made it even more special. I am already thinking of the next event i can use this little candle for. The little tealights were a thoughtful and tasteful gift to present to the women who attended my daughter's baby shower. Furthermore, the sailboat design tied in nicely with our theme. Many shower favors are purposeless and tacky, but these tealights represented a special remembrance of the occassion. I was very pleased with this product! I was very happy with the overall quality of this product. [...] I received lots of positive feedback from guests about the candle. tasteful and thoughtful. everyone loved! The cutest candles ever ! Everyone loved the way it was packed and they looked so good. I used the candle in my daughter's room ( it was baby pwder) and the smell was not that strong ...may be I shud have ordered a stronger scent. The "baby powder" scent was wonderful. Everyone commented on it. The tins were an attractive way to display the candle. It was the perfect gift to give each person as they left the shower. This was purchased as a baby shower gift. [...]smelled wonderful. I wanted and needed something cute & personalized, but quickly. The options were plenty when it came to customizing, and we loved that they came in their own organza bag, great touch! I used the products for gift away presents. The packaging was really nice, and it had a great scent. I was just a little disappointed by how small it was. I bought the medium size. I think it should have been a little bigger. I wanted something really special for the gift bags at my daughter's 1st baby shower. The personalized candle tins really marked the occasion not to mention the lovely organza bags, which complete this lovely favor! I loved the little candles and their little bags. They were a good keepsake for my baby shower. These candles indeed came packaged lovely in little organza bags. We used them to add to table decoration and worked out well. I ordered the smallest size due to budget, but may have preferred the medium size. Overall, very pleased! I loved this candle. The baby powder scent was wonderful for the baby shower. I ordered the personalized candles for a co-ed baby shower for friends. Everyone loved them. They are cute and were very affordable - I highly recommend! We ordered these candles for table decoration and keepsake gifts for a Baptism Luncheon celebration. I was very pleased by the overall look and quality of the candle tin and custom artwork. The Baby Powder scent is very pleasing. They were well liked by guests. I would definitely order this product again. Lovely presentation and the aromas are wonderful. The buttercream scent is to die for, it literally smells like cake... you almost want to eat the candle it smells that good. I've given the 2" candles as favors at two different baby showers. The guests loved them, especially the personalized touch with the name and date on the label. It was a big hit. The only thing I would caution, is that the yellow onesie design is extremely light in color and almost too faint to see. I ended up ordering additional labels (with the green onesie) which stood out more. This was a great remembrance of the shower. Lightly scented and perfect size for a favor bag. Something people can use at home. It was a hit. What a pleasant surprise!! We purchased the candle tins as favors for my sister's baby shower. They were amazing:) The candles arrived already in the blue shear bags. All we had to do was to arrange them in a basket to place on one of the tables at the shower. The baby powder scent was perfect and reminded everyone of that "fresh" baby smell. Many compliments were received that day and the beau-coup label/ website was subtly place on the bottom of the tin. Very easy to direct friends when asked where we got the "adorable" "sweet" candles. Used for party favors at baby shower and all guests were very impressed with the candles. Candles came in a attractive bag, [...] and were a lovely scent. The guest really liked them! I would definitely recommend you and use you again! I think these candles were terrific! I bought them for my daughter-in-law's baby shower. Eveeybody loved them! I bought the candles for my goddaughters baby shower, and everyone loved them. [...]. The personalized label is very professional and the presentation (in the included organza bag) made this a delightful party favor. I wasn't crazy about the scent, but I don't like the scent of most candles so don't let that dissuade you from ordering these. I'd order them again in a heartbeat! Nice personalized thank you gift for baby shower! Baby Powder scent makes it a nice touch! Everyone seems to like candles - and each has her own way to use it - so this would be a nice choice! all my friends loved it & asked for details about where I ordered it from. its perfect & love the fact that it can be personalised. What a wonderful gift for my guests! It was easy and something very special for my guests to take home with them. I gave this for my baby shower. Everyone loved them. They smell great too. don't call me Grandma...call me Goddess! This is a gift that can be used by all and the "baby powder scent" certainly makes one feel "baby times":!!! They were a total hit! Ordered this item as a souvenir for guests at a baby shower. Q:does the 2 oz. candle come in the bag like the 4 oz candle? A:We do not offer a bag with this item. 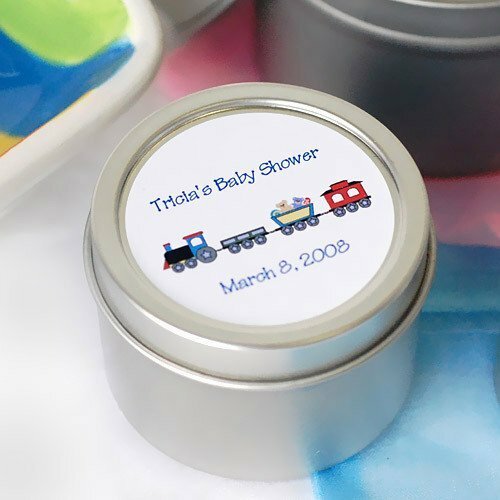 Mark wondrous occasions such as baby showers with these adorable personalized baby candle tins. 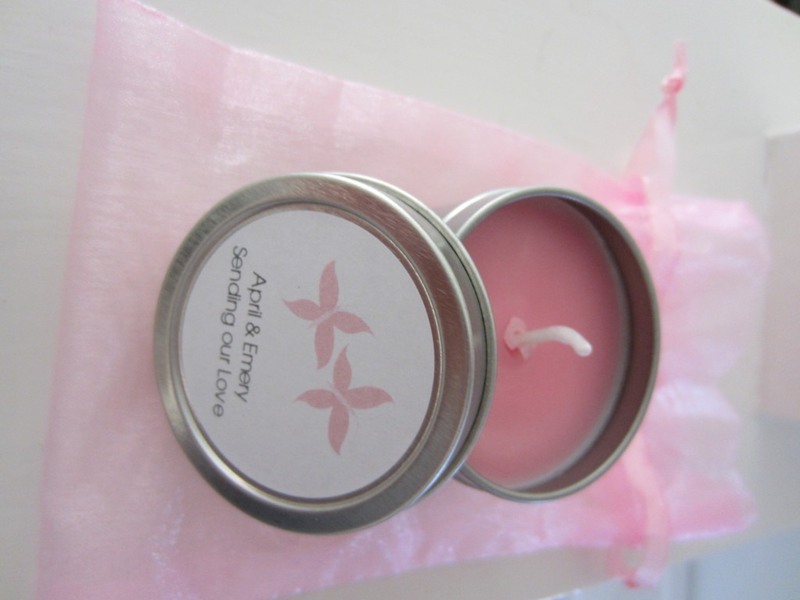 These 100% soy wax candles are perfect favors for guests to remember your baby's special day. Choose from dozens of sweet designs for your baby girl, baby boy or your surprise bundle of joy! Customize the scent and color of your candles for a made-to-order favor that is more fun than a ball of wax! Each candle tin is decorated with a personalized label and comes with a sheer organza bag in either white, pink or blue.